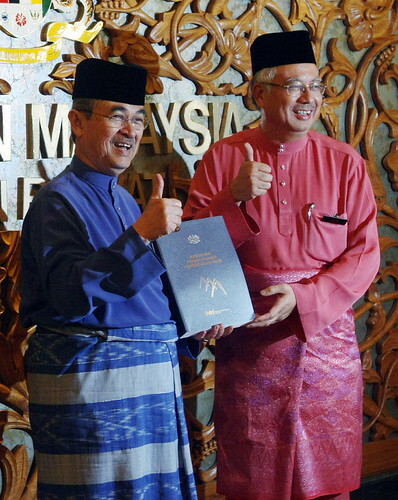 In a minor Cabinet reshuffle today, Prime Minister Datuk Seri Abdullah Ahmad Badawi named his deputy Datuk Seri Najib Abdul Razak as finance minister. Abdullah, who was the finance minister, will take over Najib’s defence ministry portfolio. In making the announcement yesterday, Abdullah and Najib also said the transition plan in which the two leaders have agreed on remains intact. By giving his deputy heavier responsibilities, the PM will hope to put an end to speculation over the transition plan which will see Najib taking power by 2010. The swap in portfolios was announced after today’s Cabinet meeting. Najib has also been made deputy chairman of Khazanah Nasional. Said Abdullah today: “I stress that Najib and I are committed to the plan that we have agreed to. Abdullah said he had informed the Cabinet, which met earlier, he was handing over the finance ministry to Najib with immediate effect. He said the finance portfolio was important, especially in light of the current economic instabilities. Najib, he said, could spend some time acclimatising himself to the duties of being a prime minister. “The timing of the handover is flexible. I will decide but I will not be staying later than 2010. If I want to go earlier that is the flexibility I have arranged. Najib, who was also at the press conference, said: “I thank Abdullah for the confidence he has shown in appointing me as finance minister. It is not just an important post but one held by the PM. On the transition plan, Najib said the agreement remained intact, and he hoped it would be accepted by the people and the party.